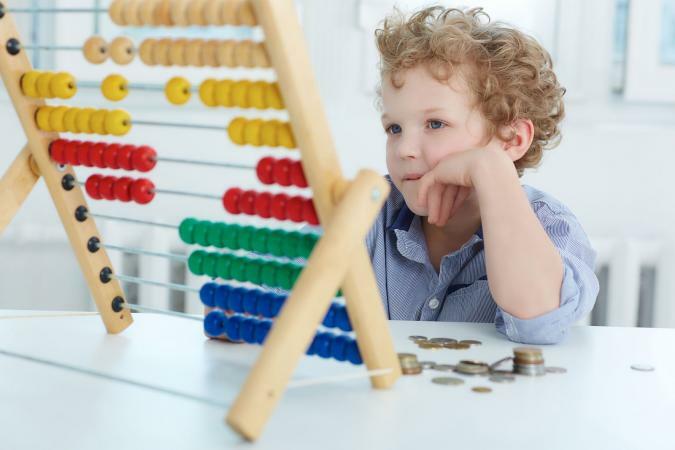 For the first few years of their lives, kids have little concept of money, aside from receiving the occasional quarter or putting pennies into a piggy bank. Because parents pay for everything, they have little idea that money actually has value and may not understand how it used to make purchases. Playing games can help teach children how money works and help them develop financial responsibility. Start your kids out by teaching them how to handle money. Help them learn the difference between coins, and how much those coins are worth by teaching them to count and sort. Have your preschooler take a pile of coins and sort it into pennies, nickels, dimes and quarters. Then help them count the number of coins in each pile. Children in early elementary school can take the game a step further by sorting coins into piles of 10, 20 or 50 or 100 based on the value of the coins. They can then practice adding up the piles to see how much money they actually have. Instead of just counting and sorting coins, you can also group them by value. Have children line up coins from the least value to the greatest value or group coins into piles and have kids line up the piles by their total value. Role-playing is a powerful tool that can help kids understand how money works, and how to use it. When you start to role-play, choose only one objective and teach it thoroughly. Although stores now have calculators to tell the cashier how much money to give back, making change is still a useful skill to learn. If nothing else, it helps kids learn how to think mathematically using coins. To help kids learn to make change, set up a mock store, and price everything for less than one dollar. Using play money, pay for items with bills, and have your child give you the correct change. You can also reverse this idea, by giving your child change and challenging him to tell you whether you've given him the correct change. Learning how to count money is an important skill. 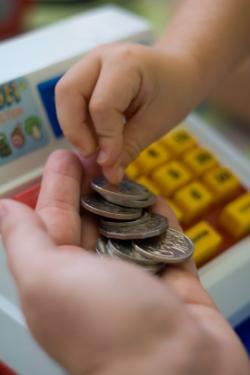 To teach your kids, set up a mock store, and then have them pay for items using the fewest coins possible or only certain coins. Have your child talk through the process as he's giving you coins. Always count aloud with him, as this helps solidify the values of the coins that he is working with. There's no rule that says that the education has to stop once you're finished in the house. In fact, outside opportunities often provide the best chances for real-life learning experiences. You can even give a kid his own wallet and use strategies to teach money management. Turn going to the grocery store into a game for your kids. Give a child five dollars, and let him see how many of his favorite foods he can buy with the money. Older children can learn how to use coupons to reduce the costs of their favorite items. For upper elementary students, provide a grocery budget, and challenge them to come up with a menu for the week that is both healthy and within the budget. Visit a bank and open a savings account with your child. Many banks have special savings account programs designed to teach children about saving and to encourage them to save. Whenever you child gets money, encourage him to set aside a portion of the money for a savings account. Start a business, such as a lemonade stand. Running the stand will be like a game for children as they price the lemonade, sell it, make change, and figure out how much money they actually made. Online money games can be used to supplement role-playing games and other strategies you use to teach about money. Many of the games incorporate real-life scenarios and give kids practice spending and saving with virtual money. The U.S. Mint's H.I.P. Pocket Change offers multiple money games for kids of all ages. For younger children, play Cents of Color to learn about the special 50 state quarters. Older kids may enjoy The Coin Memory Game or Dollar Dive. Funbrain's Change Maker helps kids learn about money by teaching them to make change. As children get answers right, the change is added to their virtual piggy banks. The game features four different levels, starting with amounts less than one dollar and ending with amounts over $100. Practical Money Skills for Life is a financial website with games geared towards kids from ages 4 through 12. Games include Financial Football, where kids answer financial questions to score touchdowns, and Peter Pig's Money Counter, where younger kids use to count and sort coins, along with many other games. These games have all the right tools to help your kids become money experts. The Allowance Game has children travel around the board while completing chores and earning money. Children learn how to save their money and manage their time as they play the game. Cash Bash is an electronic game that has children add up the value of coins. Kids can play individually or against a friend. Money Bags teaches kids to make change. As they complete chores, they earn money, but they must spin the spinner to determine how that money is doled out. For example, if the spinner says they cannot use quarters, kids must think of other ways to make the change. In classic games such as Monopoly, Life and Pay Day, kids build financial skills as they learn to buy and sell real estate and navigate life's expected and unexpected expenses. After playing a few games, consider spending some time to teach your children about the financial world. This can be your self-created money game, involving a trip to the bank to open up a savings account, or a first list of chores to earn those early dollars and cents or even a fun money worksheet for kids. Whatever direction you choose, making a game out of one of life's most important responsibilities is well worth the time and effort when you observe how much they grasp and grow.